We had our second ultrasound today. 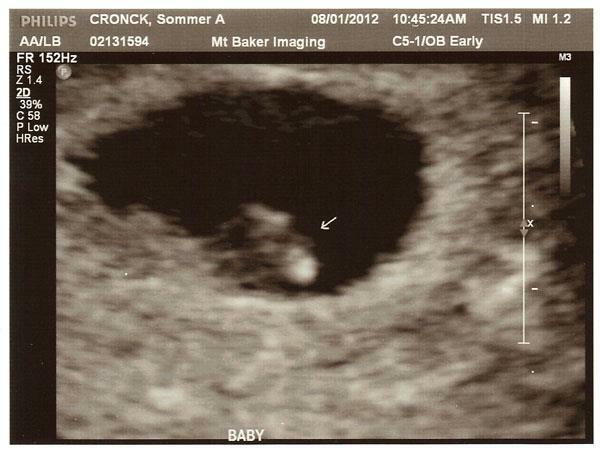 I didn’t post about the first one, which was at 4 weeks and 4 days. At the time, I wasn’t sure if I was 4 or 8 weeks pregnant, so they sent me in to “date” the pregnancy. The tech could only see a gestational sac measuring about 5 weeks, and she didn’t give me a picture (boo!). Today we went back to check for proper development and a heartbeat, and we saw both. Not looking like much yet, but measuring just right and with a little heartbeat of 135 bpm (beats per minute), here is our first ultrasound.